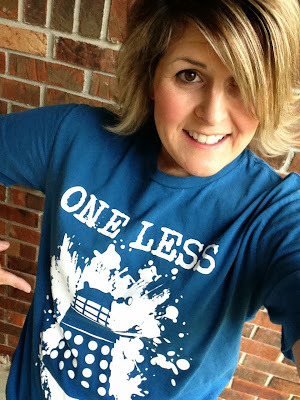 One Less Nemesis Blog: Doctor Who contest! WIN THIS SHIRT! To celebrate our new One Less Exterminator shirt, we're giving one away. All you have to do is tell us what you're most excited to see in 50th Anniversary Special by Thursday 11/7 (tomorrow) at 10 pm EST and we'll randomly pick one winner. Post your comment here, comment over on our Facebook page, or tweet us. One entry per person allowed. The shirts are already available on our website at www.onelessnemsis.com and in our Etsy store as well. If you can't wait to see if you've won or have a lot of Whovian friends that you need to get 50th Anniversary party gifts for, head on over and order now! We've got stock in sizes up to 4xl and when you buy 2 or more on our website, shipping is FREE!